Sussex’s hopes of qualifying for the knockout stages of the NatWest t20 Blast were dealt a massive blow after they lost by one run to Hampshire at Hove. The Sharks appeared to be in control when they reached 109 for 3 in the 15th over, chasing a modest target of 135 against a Hampshire side out of contention for the last eight. Chris Jordan (1) and Craig Cachopa (5) fell cheaply but Sussex still looked favourites when Brad Wheal started the final over with five needed. Will Beer took a single off the first ball from Brad Wheal and Ross Taylor one off the third before Beer ran himself out to get the New Zealander back on strike with four needed off two balls. 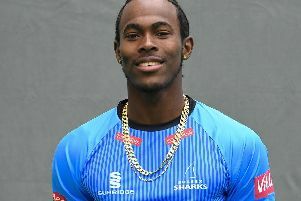 Taylor failed to make contact on the fifth delivery, which went down the leg side, and could only dig the last ball – an excellent yorker – into the leg side, running out his partner Jofra Archer in the process as Sussex finished on 134 for 8. A full-house crowd of 6,000 left wondering how Sussex had managed to throw away a seemingly winning position. Taylor and Matt Machan were initially bogged down by some accurate bowling by Shahid Arfridi and Liam Dawson, as they scored just 17 runs in five between the eighth and 12th overs. But then Taylor hit Tino Best for two sixes and in the 14th over Machan plundered two more off Dawson to put Sussex into a strong position as 33 runs came from those two overs. But Machan (29) was lbw to Wheal in the 16th over after the fourth wicket pair put on 46 from 35 balls and ultimately Taylor, who finished with 46 off 47 balls (1 six, 4 fours), was left with too much to do. Earlier, Wheal had produced another excellent yorker to remove Sussex captain Luke Wright (9) while Dawson ended a promising innings by Wright’s opening partner Chris Nash, who was caught in the covers for 32 in the 10th over. Hampshire’s score of 134 for 9 didn’t appear to be enough despite a slow, two-paced pitch. They had built themselves a decent platform at 64 for 2 in the tenth over but Tom Alsop was run out for 25 after a terrible mix-up with Dawson which ended with both batsmen at the same end. Afridi hit his first ball, off leg-spinner Will Beer, for six and looked in the mood but he too was needlessly run out after driving the ball into the stumps at the non-striker’s end and setting off for a run that was never there. The innings declined rapidly after Dawson (25) was well caught at deep mid-wicket in the 16th over by Chris Jordan, who also bowled well to finish with 2 for 14. Archer, on debut, also impressed with 1 for 27 including the wicket of Adam Wheater (17) in his second over. Sussex will probably need to win their last three games to have a chance of reaching the knockout stages, but that looks unlikely on current form. Since winning three of their first four they have triumphed once in seven matches.